Imagine if someone captured your childhood on film, with all the seminal events that helped shape you into the person you are today. (Didn’t Facebook do this with our photos and videos last year?) How would it look? Would it be compelling viewing to anyone other than you, your family and your close friends? Which events would you include – getting your first pet, performing in your first school play, having your first kiss, moving to a new neighbourhood, breaking your arm, experiencing the death of a friend? How about playing video games, learning how to throw a football, or just hanging out with your father? This is what director Richard Linklater (the BEFORE film series) has created with BOYHOOD. Filmed over a 12-year period and using the same actors throughout, BOYHOOD follows young Mason Evans Jr. (Ellar Coltrane) as he grows up to ultimately become an 18-year-old university freshman. It is an interesting concept and certainly a laborious one. It is similar to what director Michael Apted has done with his UP series of documentaries (56 UP was released in 2012), except that Linklater’s film is both fictional and shows us what happens to someone year after year rather than relying on testimony every seven years as Apted’s films do. Unfortunately, nothing much happens to Mason. We see him drinking his first beer and pumping gas into his first car but are these really his formative moments? The closest we get to witnessing any drama in his life happens when his mother’s second husband smashes a glass on the dinner table. Perhaps we have been conditioned to expect to be taken on a journey when we go see a movie. If there is a cause, there should be an effect. In one scene, teenage Mason comes home late after being at his first keg party. His mother’s latest man chides him for being irresponsible. Great – drama at last! But all Mason does is shrug his shoulders and head off to bed. And the story moves on. If he gets grounded, we don’t see it. If he runs away overnight, we don’t see it. If he contemplates suicide in a moment of teenage angst, we don’t see it. I don’t want to say that this is laziness on the Linklater’s part because committing to a project of this scope is anything but lazy. We’re given a glimpse into his rationale at the very end of the film when a new friend of Mason’s says that the concept of carpe diem is all wrong. She says that we don’t seize events. Events seize us. But I disagree. Some of us do seize events. That is what is called “good luck”. When Mason is getting ready to leave home for university, his mother has her own epiphany. “I thought there would be more”, she says. The film’s message is that there isn’t anything more. No, no, no! I don’t believe that we are put on this planet only to be passive players in the drama of life. True, we don’t all soar and have lives beyond anyone’s wildest dreams but we do have moments in our lives when we do get our feet off the ground and fly for just a bit. Sadly, Mason doesn’t fly, or we don’t get to see him fly. He merely exists, as events happen around him. The most interesting aspect of the film is that we get to watch Mason grow. His hair gets long then it gets short. He enters puberty and then he goes “emo”, complete with the nail polish. The changes we see in his parents (played by Linklater regular Ethan Hawke and Patricia Arquette) are less impressive to us because we have seen them both on movie and TV screens many times over the years. 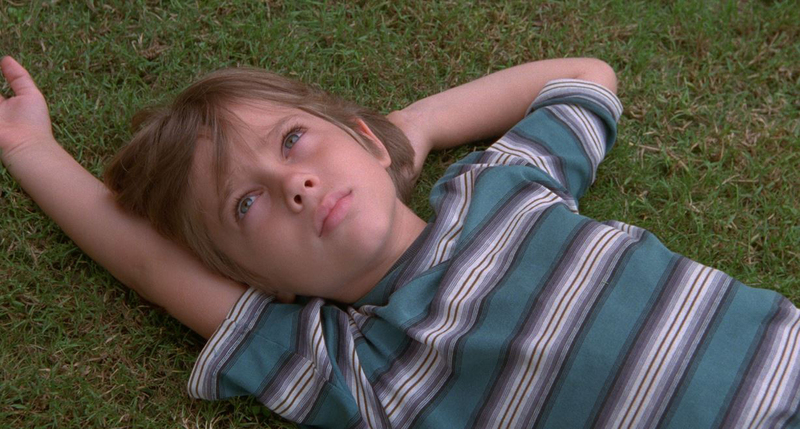 BOYHOOD is ultimately nothing more than a series of marginally connected vignettes. Nothing really gives us any indication about Mason’s behaviour and motivation. Don’t get me wrong about this film. I respect the director for his ambition but, for me, this film should have been called BOYHOOD: A DULL LIFE. I can’t resist including this parody of the film, called CATHOOD. Enjoy!